I tried this orange poppy seed bread recipe because there’s a lack of orange flavored goodies on Cookie Madness, and occasionally I meet people who really like orange. A baker’s gotta be prepared, right? So I made this bread for fun and was blown away by how good it was. It rose nicely in the center and was as dense and sweet as pound cake. The original recipe from The Junior League Celebration book categorizes it as bread, but trust me — it’s cake and it will satisfy you like cake. It halves nicely, so if you only need one loaf then no problem. A couple of tips: Grease and flour the bottom only and leave the sides bare so that the bread clings to the sides and rises in the middle. If your pans are nonstick, just line the insides with foil to cover the nonstick coating, then only grease and flour the bottoms. 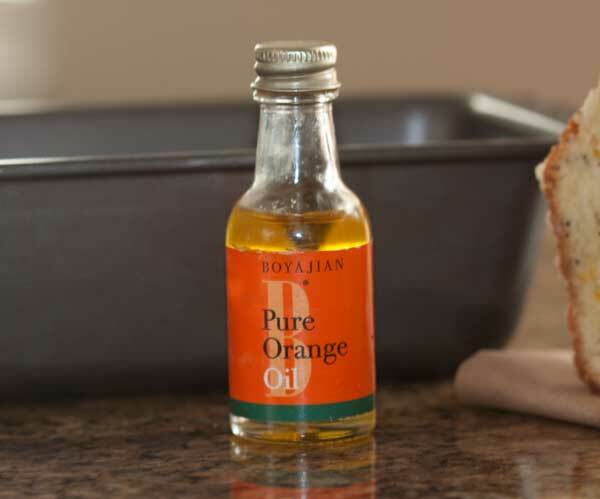 The second tip is to enhance the flavor by adding a bit of good orange oil. The only citrus flavorings I like are by Boyajian, so at one point I bought a little trio of lime, orange and lemon oils. They’ve lasted a couple of years and they always seem to make lime, orange and lemon things taste a little more like what you’d get at a bakery. They’re a good investment. 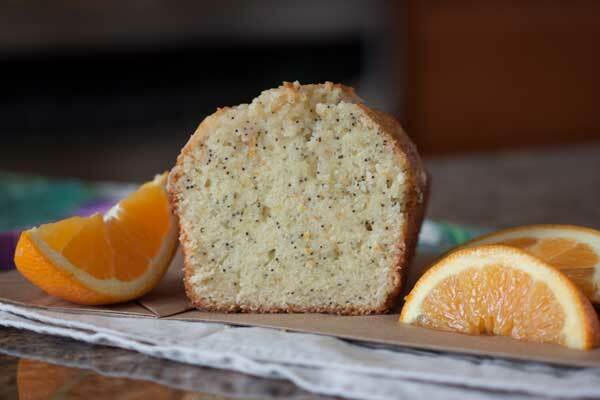 Orange Poppy Seed Bread is an easy orange quick bread with a light orange glaze. To kick up the orange flavor I used a little Boyajian orange oil. Preheat the oven to 350 degrees F. Grease bottoms only of 2 8x4 inch loaf pans. In a large mixing bowl, combine the flour, sugar, poppy seeds, baking powder and salt. In a second bowl, whisk together the eggs, milk, oil, orange zest and vanilla. Add the liquid mixture to the flour mixture and stir until smooth. Pour into the loaf pans, dividing evenly among the two, and bake for 1 hour at 350 F.
Let loaves cool. While they are cooling, mix together the ¼ cup orange juice and the powdered sugar. Add a tiny splash of vanilla. Prick the loaves all over the top with a skewer, then slowly pour the glaze over the loaves. Let them cool completely. If you halve the recipe, use 1 large egg plus 2 tablespoons of lightly beaten egg or try 1 jumbo egg plus 1 yolk. If you use White Lily flour, make sure to weigh out the equivalent amount since the volume of White Lily is a little bit less per cup than regular all-purpose. Your orange bread looks delicious. I like orange in baked goods but don’t really seek it out. Judy, thanks for the validation! Any other recipes from that book you recommend? This one was just so fantastic. Have you ever tried making it in with lemon? This cake bread cross section looks blue ribbon worthy!! I only wish my quick breads would look so good. I appreciate your tips on how to make these quick breads rise. I’ve made so many flat quick breads. I always try to find a way to add orange to baked goods. I think panera adds a bit of orange extract or oil to their icing on their pecan braids which makes them irrestible to me. I use this exact recipe from Celebration Junior cookbook. I think I will try it with the orange oil next time like you did. My recipe calls for both vanilla and almond extracts. 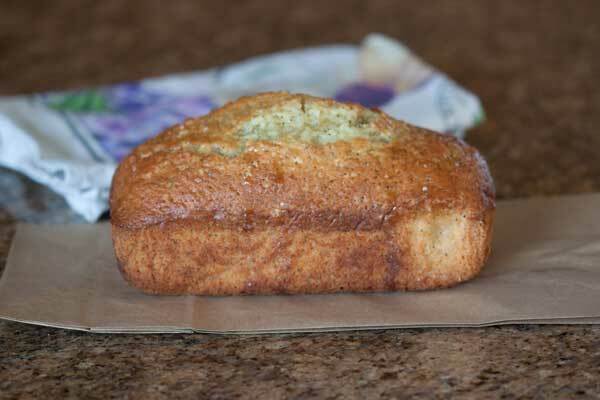 This is my go-to recipe for orange bread – delicious! Shirley, if you have found any interesting blueberry recipes, let me know! We’ve been enjoying the lower prices this season. Todd, I’m so glad they liked it. I’m going to make this one again soon. This was a big hit at work today. This looks and sounds great, Anna … and we love orange. I’ve made a note to try it in the fall. Right now I’m SO in love with the white peaches and nectarines and, of course, blueberries … so they seem to be appearing every day while they’re at their peak! But I’ll be back to this. I even made a note on my calendar!